How I am feeling: Overall, pretty good. My energy levels were really great, but this summer heat is def. taking a toll on my energy levels lately. Hoping my great energy returns soon. I did develop some varicose veins on my left upper leg area that are causing me some discomfort. I am now receiving acupuncture for them and wearing some compression spanx during the day to help ease the discomfort and help prevent more from developing. 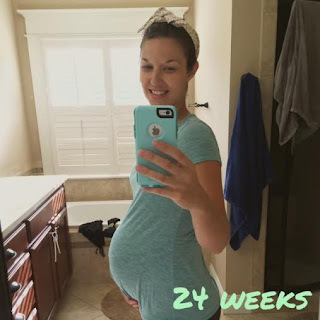 Other Fun Info: The nursery is coming along. We have all the furniture in and the crib and linens are up. I am starting to put up wall decor too. 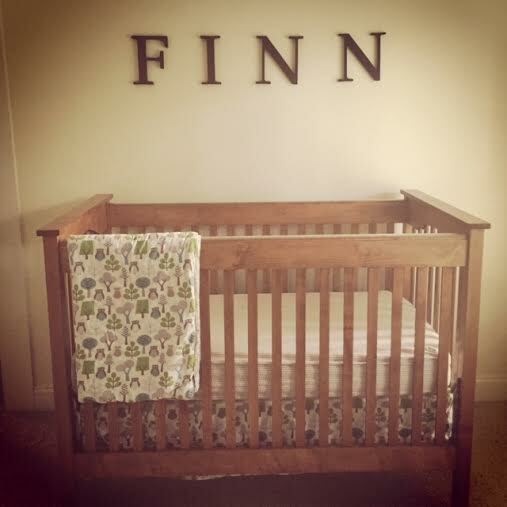 Enjoy a photo of the crib all ready to go with the "FINN" wall decor. More photos to come soon!